As CEO and co-founder of innovative medtech company Field Orthopaedics, Dr Chris Jeffery has worn a number of different hats. But his focus on pulling apart and solving problems is a constant. 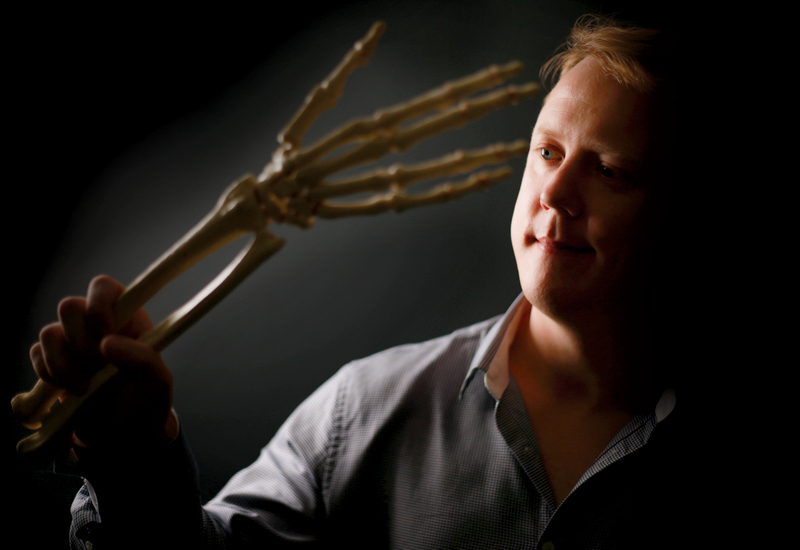 Wanting to broaden his expertise with a bionics PhD on the way to a role as an orthopaedic surgeon, Dr Chris Jeffery was told by a mentor to “go find problems worth solving” and make a real impact. “They sent me back out in the world to hospitals, and that was really the catalyst for change,” the CEO and co-founder of Field Orthopaedics told create. Finding and tackling problems is life for Jeffery, who at just 31 years has achieved a surprising amount. His line from graduating in electrical and computer engineering (with an honours thesis that won the JH Curtis Award) to medical innovator has not been a straight one. 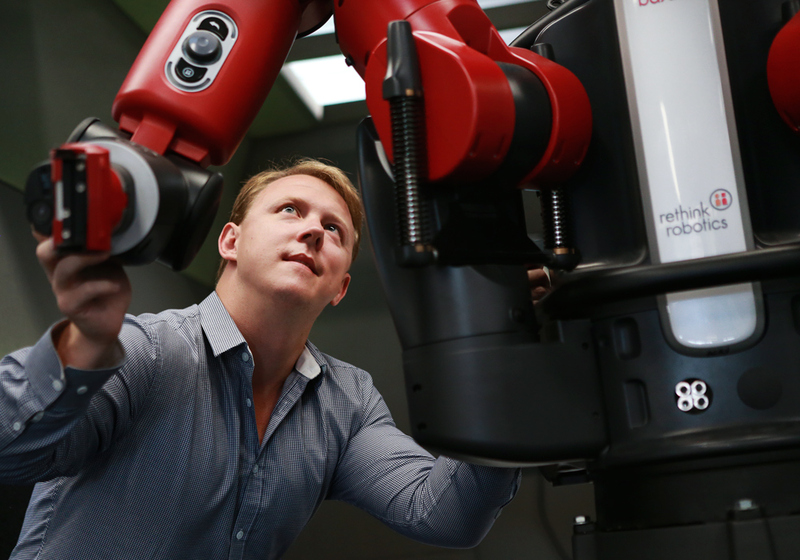 Jeffery with a Baxter collaborative robot. He served as a Royal Corps of Australian Electrical and Mechanical Engineers (RAEME) officer after graduation, receiving an Army Capability Development award for developing an AI platform to speed up deployment in the field. He was then deployed to Iraq and Afghanistan. “You’re like the COO of the company, where the CEO or the commanding officer in the army sets the plan and the adjutant enforces and implements the plan,” he said of his service as an adjutant. Time spent with doctors in the Middle East inspired Jeffery to change career tack and pursue medicine. He qualified as one of five to earn a full scholarship – including a concurrent MBA during medical school – through University of Queensland’s Medical Leadership Program. coming back with a whole bunch of business ideas,” he said. The first of these emerged as an answer to a serious problem he experienced on placement as a junior doctor at a children’s clinic at Ipswich General Hospital. “The average patient was five years of age, referred because they were missing developmental milestones, withdrawing from family or friends, or having behavioural issues,” Jeffery said. A threshold-based audiogram was required for diagnosis, with a wait time of 18 months to see an audiologist. A wait to see Jeffery? 12 months. He wrote a logic-based program on a Raspberry Pi to emulate the screening, later starting Audera to commercialise this IP. A consumer element also became part of the company, which makes headphones that adjust to a user’s hearing profile. “Three years down the track – literally thousands and thousands of audiograms – we’re yet to see a perfect audiogram,” Jeffery said. Mentors asked Jeffery why he was devoting so much time to ear, nose and throat problems when he wanted to be an orthopaedic surgeon. He began to focus on issues with upper limb extremity devices, where four out of 10 patients suffer complications. The wrist is a hard joint to fix because of its complexity and range of motion. The first problem was severe arthritis of the wrist, affecting one in six people over 60. There is no way to replace the complex joint, unlike with a hip or knee, and options range from painkilling drugs to fusing the wrist. “Essentially two joints in one, it’s got a massive circumferential range of motion,” he said. This led to a total replacement method using magnets to stabilise the wrist, which Field Orthopaedics was formed to commercialise. Early this year the company made news with the cheapness and speed of development for the Field Micro Screw, taking 12 months and $600,000 (compared to an average of 31 months and $39 million). The device for treating small fractures is currently awaiting US FDA approval. These two companies and another have incubated within RER Labs, which Jeffery co-founded. The company started working on outside projects, provided they are suitable and sufficiently problem-based, in the past two years. “I call it the engineering dilemma,” Jeffery said of the wrong way of developing an idea. Asked about the difference between leading a project and leading a company, the entrepreneur said he doesn’t see a huge division between them. For both, it’s essential to understand the purpose and what problem is being solved. What is the essence statement, the barriers and the plan to overcome these? 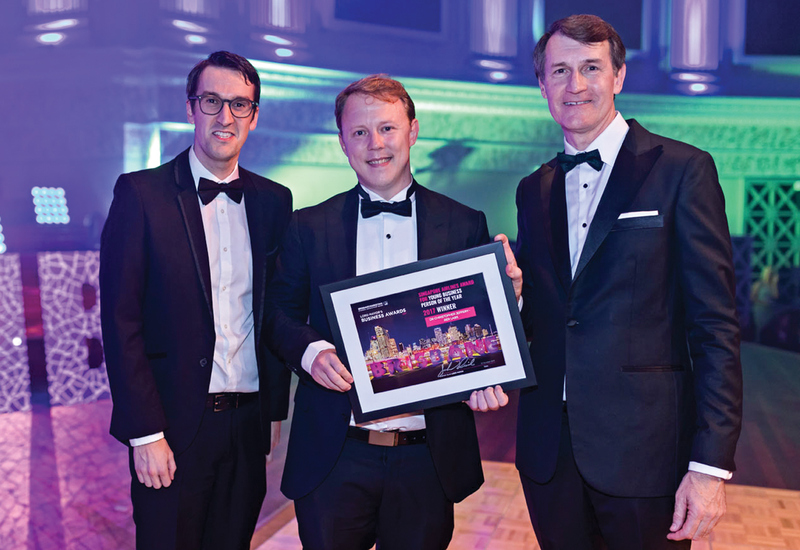 Jeffery receiving the Young Business Person of the Year at the Brisbane Lord Mayor’s Business Awards in 2017. “They’re both tricky, probably for the same reasons, and that’s managing human capital: so managing the people, the team, from the project point of view, or contractors that might not be as motivated or as invested or as effective as you; versus the company, which is how do you manage the people in your team. You need to all be as invested and driven to solve that,” he said. Things like brand messaging are a concern for a company, though perhaps not for a project. “The only difference between project and organisation is I suppose in an organisation there’s a few other elements, and you have to change your mindset: it’s not always a technical mindset,” he says. How can you make the jump from project leader to business leader? Dr Chris Jeffery will share his insights at the upcoming Australian Engineering Conference. To register, click here.